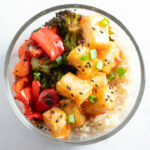 Low FODMAP Sweet Chili Tofu Bowls – crispy baked tofu tossed with a sweet chili sauce served with roasted FODMAP-friendly veggies and whole grain brown rice. Vegetarian and meal prep-friendly. Drain and press tofu for 30 minutes trying to remove as much excess moisture as possible to produce a crispier baked crust. After pressing, cut tofu into bite-sized cubes and set aside. Preheat oven to 400°F. Line two baking sheets with parchment paper. Toss tofu with 2 Tbsp. olive oil. Add cornstarch and toss to coat. Place tofu on a baking sheet, spreading evenly so that none of the pieces are touching. Toss broccoli florets, carrot pieces, and bell pepper pieces with remaining 1 Tbsp. olive oil. Spread onto a second baking sheet. Bake tofu and veggies for 15 minutes. Flip tofu and veggies and bake for 15 minutes more, or until veggies are fork-tender and tofu is just golden brown. The time may vary depending on the size of tofu and veggie pieces. While the tofu and veggies are baking, prepare the Sweet Chili and Ginger Sauce (below). Remove tofu from oven and place in a bowl with Sweet Chili and Ginger Sauce. Toss to coat. Serve warm with veggies and rice topped with optional sliced green onion tops and sesame seeds. Or, divide into containers and refrigerate for up to four days. Note: The tofu will soften (but still be yummy) when stored in the fridge. Whisk all ingredients together. Place in a small saucepan and bring to a boil, stirring frequently. Reduce heat and simmer until the sauce starts to thicken. Cool slightly, the sauce will continue to thicken, and serve or store in the refrigerator for up to four days. Sambal Oelek: Sambal oelek is an Indonesian condiment made from red chile peppers, vinegar, and salt. Although not officially been tested by Monash, sambal oelek is made from low FODMAP ingredients. Chiles and peppers do contain capsaicin which is a naturally-occurring compound that contributes to their spiciness. Capsaicin may be a non-FODMAP trigger for some individuals with IBS. Firm Tofu: A low FODMAP serving of drained firm tofu is a ⅔ cup (cubed) or 160 grams. Broccoli: A low FODMAP serving of broccoli florets is a ¾ cup or 75 grams.